All moaning aside, one thing that I do actually love about Easter is the opportunity it provides to get creative with your baking. Simply type ‘Easter Baking’ in to Pinterest and prepare to be blown away by all of the wonderfully eye catching creations ranging from Crème Egg brownies to ‘gravity defying’ chocolate egg cakes. All of these seemed such a long way off from the chocolate crispy cake nests that we all used to make as kids! In my opinion it’s always a good idea to stick with the classics, therefore I knew I wanted to make something featuring both chocolate and Mini Eggs. However after a long time spent perusing other people’s creations online, I knew that I also wanted to try something a bit different. The end result was the Easter Speckled Piñata Cake. The piñata idea and the speckled icing effect were both things that I saw online and wanted to have a go at myself. I feel like both worked out quite well and while the overall effect is quite simple I feel there is definitely no mistaking what time of year this cake is designed for. Mini Eggs, Lindt Bunnies, Sainsbury’s ‘Micro’ Eggs and Cocoa Powder for decoration and filling. 2. Put the butter, chocolate, the instant coffee granules and 125mls of cold water in a heavy based saucepan and then place over a gentle heat until everything is melted. 3. While the chocolate mixture is melting, put all of the dry ingredients in a large bowl and mix together until well combined and free of any lumps. 4. In a separate bowl beat the eggs and milk together. 5. Once the chocolate mix has melted pour it, and the eggy milk mixture in to the dry ingredients and mix until smooth. 7. Now bake the cakes for 1 hour 25 minutes until they are well risen and a skewer inserted in the centre comes out clean. 8. 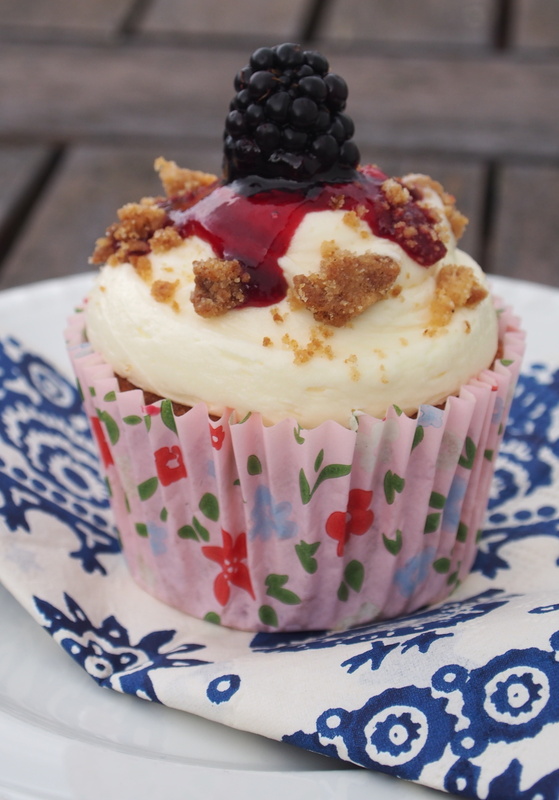 To make the buttercream icing (I would suggest doing this while the cakes bake) beat the softened butter until pale and fluffy and then gradually add the icing sugar until well combined. You can add a dash of milk if it is feeling too stiff. 9. Add the food colouring. 10. To assemble the cake, first cut the domed top off of the cakes and then cut the cakes in half so you have four, even, flat layers. 11. Buttercream between each layer of cake. 12. Leaving the forth layer of cake to one side, cut a hole in the centre of the 3 layers of cake and fill with the Micro Eggs. Now put the forth layer of cake on top to act as a lid. 13. Cover the cake in a rough layer of buttercream and place in the fridge or freezer for a few minutes to stiffen up. 14. Remove from the freezer and cover in another layer of buttercream. Now using a scraper or palette knife you need to scrape off the excess icing leaving a smooth finish. 15. To give the cake a speckled effect mix together cocoa powder and water and then flick this over the cake using a clean acrylic paintbrush. 16. 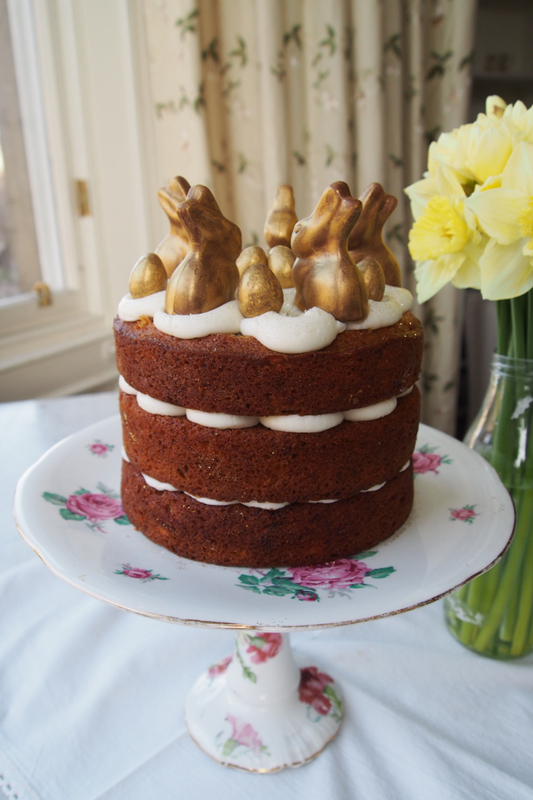 Position the Mummy and Baby bunnies on top of the cake and then finish off with lots of mini eggs! 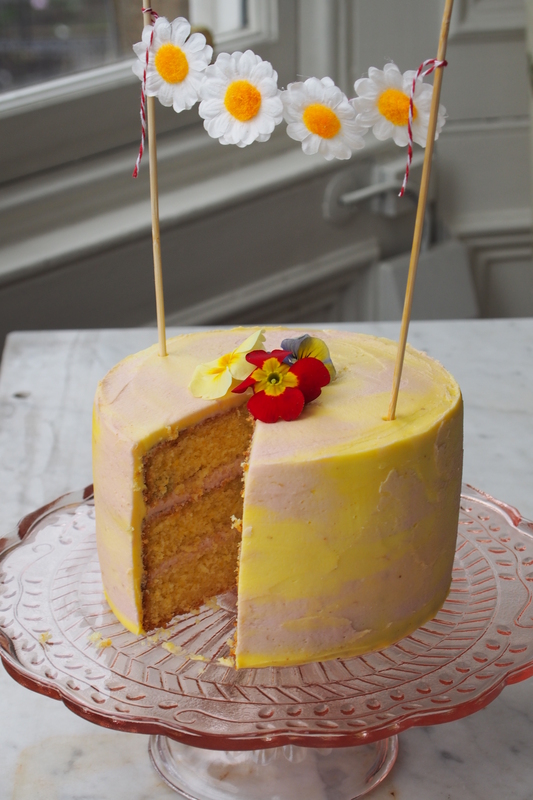 This looks wonderful – love the colour of the icing, so vibrant! Thank you very much! 🙂 Love your Blog by the way! Ah, thank you! All very new to me still so a work in progress!